•Glass Thickness – Original equipment manufacturers (OEM) require glass thickness to conform to a 1000th of a millimetre. The windscreen must fit correctly in the aperture. Too thick or thin will result in a poor fitting windscreen which will compromise your vehicle’s strength and integrity. •Size and Shape - Shatterprufe® fits perfectly, offers the correct adhesion and provides optimal support when airbags are deployed. •Cross Curvature – If the cross curvature is not uniform it may result in the windscreen wipers not working effectively and could create an unsafe situation. Horizontal draw lines result in distortion but Shatterprufe® vertical draw lines ensures clear vision. •Shade Band Position – Shatterprufe® windscreens offer a consistent shade band that protects the occupants from the sun’s glare. •Edge Stress – A vehicle is designed to flex up to 30%, putting immense strain on the windscreen. Shatterprufe® glass is able to absorb the stress without cracking and saves you unnecessary replacement costs. 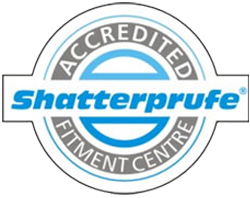 •Material Performance – Shatterprufe® laminated glass products maintain optimum standards, which provide on-going safety and clarity. •Moulding Marks – Quality control eliminates unsightly marks caused by tooling to ensure potential weak spots are eliminated.